You've probably heard the phrase, "If you build it, he will come," from The Field of Dreams. Kevin Costner is walking through his cornfield and the eery voice repeatedly whispers these words to him. I love this scene because each and everyone of us has had our own "cornfield scene" at one moment or another. The only thing that differentiates us and Kevin Costner is our willingness to actually LISTEN to that voice and ACT as a result. I heard that voice after my daughter was born. It was louder than ever before. And I KNEW there was something more, I just couldn't quite figure out WHAT that something was. I knew the tenants of what I loved to do and give in the world were, but the mechanism by which I could translate that in to an actual income to support my family was the missing (and scary) link. Despite this fear, my knowing was too strong to ignore, so I took one step after the next and within one year, I left my 10-year corporate career, launched my own business and matched salary from my previous job. I built a BRAND, not just a business, on the solid foundation of my heart's calling. I stepped in to the light and took ownership for my vision and constructed something I am very proud of. Through consistency, my artistic abilities and a lot of hard work, I have crafted a brand based upon my thoughts and ideas and I have fun each day trying new things. We all have the ability to tell our stories. Surely, it takes courage, but when your heart sings loudly enough, it's hard to ignore. Telling my whole story has been one of the most cleansing and powerful things I'v ever done. The message behind this blog is a plea to you to stop waiting. If you have a dream, an idea an inspired vision, GO FORTH AND CREATE IT. Build a beautiful brand that others can admire and learn from. It's as simple as choosing to begin. Sign-up for SOMETHING, whether that's a course or to work with a coach...investing in your dream building process and holding yourself accountable with another person to help you make it happen is a powerful step. You can visually (and quickly) see what others are seeing in the process of communicating your brand message. You can troubleshoot the spots where the message is confusing. You can START before you're ready in getting others on board with your vision. When I launched my business, I shared my site with a few friends and their support, encouragement and feedback made me feel less alone in the process. By getting the ball rolling in these areas, you are making a concrete time (and potentially financial) investment in making your dream happen. You will get to test out how it feels, snap on the training wheels and take it for a test drive. If it doesn't work or it doesn't feel like you thought it would, you haven't quit your day job, you haven't invested thousands and thousands of dollars and you have spent time really fleshing out where it is you want to go. I would call that a win! For those of you looking get started on the process, one of my promises to my former self was that I would build something for others who were in the same boat. I wanted to create something that would give them the steps and tools and support to move forward on their dreams, instead of waiting because they didn't have the technical know-how. So, I mapped out my process and put together a cheat sheet and 6-week short cut to help you launch your Brand. Here she is: Beautiful Brand. Beautiful You. I made it with my heart and with you in mind. Life is too short to wait. I can't even imagine if I were still sitting in that chair today, resigning myself to the idea that this was the best I could do. I can't imagine what I would be feeling like inside with a 1-year-old daughter at home and all of the things I would have missed if I hadn't taken this leap. I believe in you and your dream. 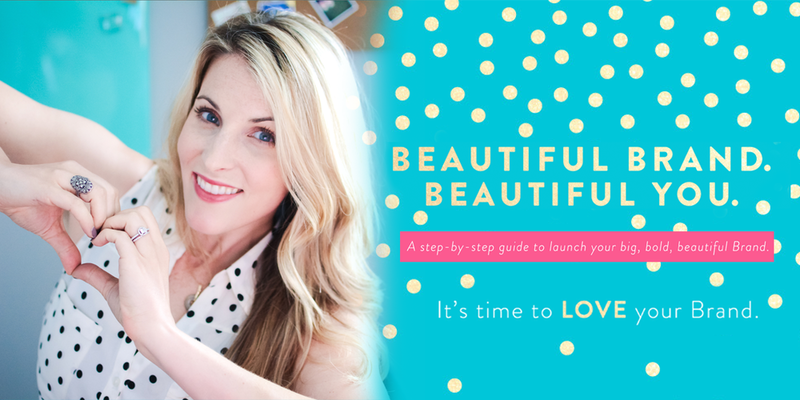 Grab my FREE Clarity Creator Toolkit and get focused on designing a Brand you ADORE! We love + respect your privacy.